New smart home innovations are changing the way we interact with virtually every aspect of our houses, condos and apartments, helping save time, money and energy. Tech expert and author Amber Mac shares her thoughts on smart home products and services that offer the best bang for your buck. 1. Smart appliances. Smart home appliances deliver real everyday convenience, allowing you to control and monitor their activities right from your phone. GE’s new Wi-Fi Connect app puts control of your fridge, stove, dishwasher and laundry right at your fingertips. Running late? Use the app to set the extended tumble feature on your dryer, ensuring your clothes stay wrinkle-free. 2. High-tech “recipes.” Create your own digital recipes to make your home smarter. A great program is IFTTT (If This Then That), an app that allows you to automate and connect your favourite web services and smart products. For example, you can set-up an applet to automatically unlock your door when you’re just steps away, mute your phone when your calendar shows that you’re in a meeting or even give you a ring when your oven is adequately heated. 3. Voice assistants. Voice assistants, like the highly anticipated Google Home, can help busy families manage day-to-day tasks. Ask a simple question and get real-time answers, including the latest weather, traffic, financial information, sports scores and information for local businesses. Plus, thanks to its integration with other smart home apps, you can use a simple voice request to get a recipe, play music, turn on your lights, adjust the temperature in your home or switch on your favourite movie. 4. Smart security. Some technologies add real value to our lives, and what could possibly be more valuable than the safety and security of our loved ones? Smart home security systems allow you to monitor the comings and goings of your family and any visitors, alerting you when suspicious activity is detected. The August Smart Lock is especially great for weekend guests, allowing you to give them access to your home without providing a key. 5. Energy efficiency. Finally, save money and protect the planet with smart thermostats that can automatically monitor and manage the temperature in your home. The Nest Thermostat learns when you’re away and sets itself to an eco-temperature to save energy. Ready to head home? Adjust the temperature from your phone to ensure it’ll be cozy when you arrive. 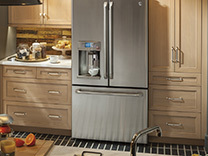 Find more information online at geappliances.ca.